Fleet risk management specialist DriveTech has made the Road Victims Trust its chosen charity for the whole of 2019 as part of its commitment to road safety and driver training. 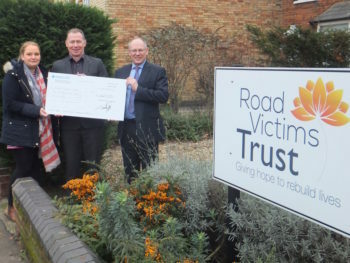 The charity works in partnership with the police and HM Coroners, taking over from them to support the bereaved and anyone else who is affected by a road death in the counties of Bedfordshire, Hertfordshire and Cambridgeshire. It also offers the possibility of telephone support in other areas of the country. DriveTech’s support for the valuable work achieved by the charity has already started with a donation this month. As part of the firm’s build-up to the Christmas break, staff took part in an annual internal charity fundraiser consisting of fun quizzes, wearing festive jumpers, bingo and much more, raising £260. Further charity events are planned for this year.